Though just barely, it is still January as I write this so Happy New Year to everyone! 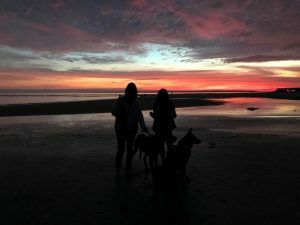 I was lucky to spend part of my holiday on a Georgia coastal island and I’m still enjoying “island time”, but I’m ready to get back into the swing of things. 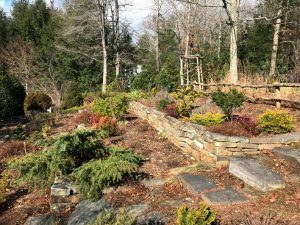 Asheville NC, where I live and garden, had the wettest year on record last year since 1860. Depending on what microclimate you look at, Asheville received 80″ of rainfall in 2018 compared to our average of about 44″. The year finished with a final insult on December 28 of almost 5″ of rain in one storm and we have not dried out since. My garden has clay soil, but good drainage in most areas. It will be interesting to see if I lose any plants from too much water, although right now most plants look fine. 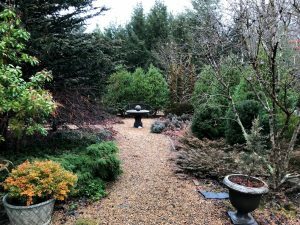 I will not be surprised to see herbaceous plants like lavender, artemesias, and perhaps even heucheras rot over the winter due to saturated soil. Time will tell. More obvious is damage to plants from an extremely wet and heavy snowfall in early December. 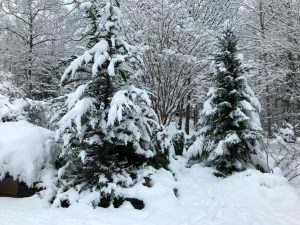 Totals around Asheville were 5″ – 8″ and much more a little north and east of us. I polled my nearby gardening friends for evergreens that did well and those that did poorly under the weight of this very wet snow load. One of the worst conifers for heavy snow, and one that I love to use the for its sculptural qualities, is Thunderhead Pine, Pinus thunbergii ‘Thunderhead’. At right is Mignon’s heartbreak from this past December. I had the same experience the year before when I lost the top out of a big Thunderhead Pine. 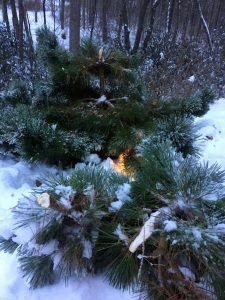 The trick is to gently remove the snow from the branches without breaking them in the process; that is if you have the time and inclination to go out in a snow storm to tend to your conifers. Because this pine naturally grows in an asymmetrical form, the tree can still be salvaged after an event like this. In a few years, the loss will not be noticed … much. Several tall narrow evergreens with ascending branches made the “worst” list, including Buxus sempervirens ‘Graham Blandy’, Juniperus chinensis ‘Spartan’, and Ilex crenata ‘Sky Pencil’. 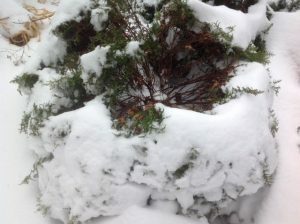 The other evergreen plant that really took a beating in the heavy snow was Globe Arborvitae. There are several cultivars, of which I have many, and they all split and splayed from the center of the plant as in the picture below. I will say that after the somewhat timely snow removal, all of my globe arborvitae bounced back. Everyone agreed that the Spruces and the Hinoki Falsecypress were absolute champs. Evergreen pyramidal hollies such as Ilex ‘Patricia Varner’ and ‘Nellie Stevens’ were unfazed. Sieglinde made the observation that broadleaf evergreens and conifers that have been pruned hard hold up better to heavy snow because they don’t have the previous year’s soft growth and the hardened wood is more stout (see the Buxus suffruticosa hedge at right). In the picture below on the left is Fernspray Hinoki, Chamaecyparis obtusa ‘Fillicoides’, and on the right is ‘Bruns’ Serbian Spruce, Picea omorika ‘Bruns’. Both are always unscathed after a big snow. 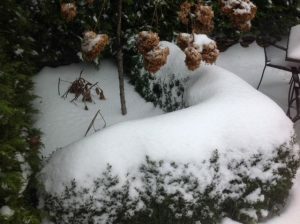 On the far left of this picture is a deep pile of snow covering Heller Holly, Ilex crenata ‘Hellerii’. This plant is so stiff that you can practically walk across the top of it, so snow is no problem. Another plant that did exceptionally well was the Skip Laurel, Prunus laurocerasus ‘Skipkaensis’. The Skip Laurel is a wonderful plant for gardens in much of the US and elsewhere. At first glance it may seem somewhat humdrum, but what a performer. It has lovely lance-shaped bright green leaves and a fragrant (some may say odoriferous) white flower. What makes it so useful is that it will do in sun or shade, make reasonably fast growth, and has no serious pests. It makes a terrific hedge and a great backdrop for showier plants. And it is a remarkable long-lived plant. 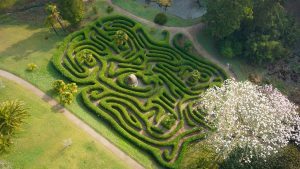 The picture at left from the National Trust shows the Glendurgan Maze in Cornwall, UK. The maze was planted with Prunus laurocerasus in 1833 as a playground for the twelve children of the household. Today it lives on, tolerating regular pruning and lots of foot traffic. A few years ago I replanted my terrace garden from mostly perennials to mostly small evergreen shrubs and dwarf conifers. Although the perennial plantings were gorgeous in the summer, the area looked pretty bleak for at least six months of the year. Now, even in the dead of winter there is color and texture and form. In the summer, the flowering shrubs and few perennials that remain add to the show. It is now a year-round point of interest. The key to using evergreens, and any plant for that matter, is to know their ultimate size and be ready to manage them when they get large. That may be planting where there is plenty of space, pruning to manage the size over the long-term and even transplanting when they’ve outgrown an original planting place. I’m sure we’ve all been surprised by how quickly some plants get “bigger than I thought”. Nursery plant labels can be deceiving as they often represent ‘mature size’ as really a ‘ten-year size’. 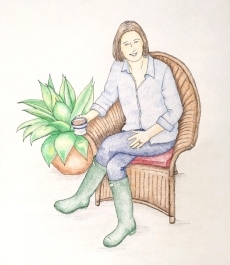 So the key is to research and cross-reference many reliable sources of information about a plant you’re considering, so you know where to put it or how to handle it down the road. Having a good amount (35% – 45%) of evergreen plants, both broadleaf and coniferous, in your garden will make it really interesting for the whole year to come. Happy snow day here in Chicago. lived there for the past 30 years. I went to camp in East Flat Rock. Thank you Amy! My husband is from Chicago and has a lot a family there still. We’ve been checking on your temps and hoping you all stay warm and cozy.